Willingway, the addiction treatment experts, presents their first annual Scholarship for the Arts during Honors Week at local schools. 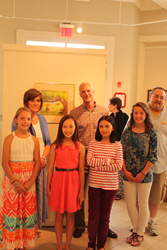 The Youth Arts Scholarships go to deserving students from schools in the Bulloch County area. "Willingway hopes that students find many rewarding and enriching activities in life without the need of alcohol & drug use”, said Barbara Reid, CEO, Willingway. The scholarship winners are selected by the schools’ art educators for outstanding commitment to academics and great artistic and creative potential. The awarded scholarships will enable students to attend the Averitt Center for the Arts Summer Arts Program. In addition to awarding the scholarships, Willingway counselors will spend one day each semester meeting with the teens at the Averitt Center for the Arts to talk preventatively about substance abuse. Over the past 40 years, Willingway, located just outside historic Savannah, Georgia, has helped more than 20,000 patients recover from alcohol and drug dependency. For more information, visit http://www.willingway.com.